We love playing with dominoes! There are so many patterns you can make with the dots on them. how many are there where both ends are the same? can we make lines of the ones that add up to different numbers? what's the longest chain I can make where the ends of two dominoes match? 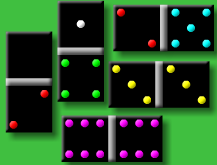 Once you've got to know all about the dominoes, make some patterns with them on the table or floor. What ideas do you have? Send them in - you could describe them in words or take pictures and send them to us. If you haven't got any dominoes you could print a set of your own from here. Describing Sequences. Dominoes. Odd and even numbers. Factors and multiples. Multiplication & division. Patterned numbers. Interactivities. Addition & subtraction. Combinations. Investigations.